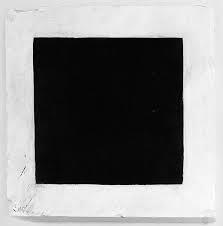 The canvases Black Square, Black Circle and Black Cross assemble the fundamental forms of Suprematism. Malevich painted them for the ‘XIV Esposizione Internationale d’Arte de la città di Venezia’ in 1924. They were sent to the Soviet Pavilion and presented in the catalogue as numbers 111-Suprematismo : forma quadrata, 112 – Suprematismo : forma di croce, and 113 – Suprematismo : forma rotonda.1 Malevich also sent five drawings of ‘Suprematism in Architecture’, in particular, designs for buildings in interplanetary space (the planits). Malevich first made the iconic nature of these pieces explicit when he hung his black square, then titled Quadrangle, high in the corner between the two picture walls at the ‘0.10’ exhibition showing ‘Suprematism of Painting’, like the central icon of the Beautiful (or Red) Corner (krasny2 ugol) found in the main room of Orthodox homes in Russia. The point of Black Square, Black Cross, Black Circle and the canvases shown in ‘0.10’ was to reduce the representation of the world of objects to the ‘zero of forms’ but this ‘zero of forms’ was a step towards the beyond: ‘I have transfigured myself into the zero of forms, and have gone beyond the zero towards cre- ation, that is, to Suprematism, to the new painterly realism, to the non-figurative.’7 All the innovators of the 1910s in Russia oppose figurative art, which ‘repeats’ and ‘copies’ the world of objects, and non-figurative, abstract or object-free art, which creates a new vision of the sensorial world, or a new space without objects, with no object other than itself. 1 Cf. Troels Andersen, Malevich. Catalogue Raisonné of the Berlin Exhibition 1927, Stedelijk Museum, Amsterdam, 1970, p. 163. 2 Krasny, which now means beautiful, originally meant red.–Trans. 3 Alexandre Benois, ‘La dernière exposition futuriste’ [9/21 January 1916], in Kazimir Malévitch, Écrits,Allia, Paris, to appear in October 2015, Annexes, p. 615. This is why the ‘black square’ was sometimes seen as a monochrome. Cf. 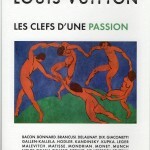 Jean-Claude Marcadé, ‘De Malévitch à Rodtchenko : les premiers monochromes du XXe siècle (1915-1921),’ in exhibition catalogue, La Couleur seule, Lyon, 1988, p. 63 ff. 5 Cf. Kazimir Malevich, The World as the Objectless or Eternal Rest. Translated from: Le Suprématisme. Le monde sans-objet ou le repos éternel (trans. Gérard Conio), CH-Gollion, Infolio, 2011. 6 Kazimir Malevich, From Cubism to Suprematism, the New Painterly Realism, Petrograd, 1916. Translation in Rainer Crone, David Moos, Kazimir Malevich, The Climax of Disclosure, Reaktion Books, 1998. 7 Kazimir Malevich, From Cubism to Suprematism. In his letter of 29 May 1915 to Mikhail Matyushin, Malevich wrote: ‘We are planning to bring out a review […] Given that in it we intend to reduce everything to zero, we have therefore decided to call it Zero. And we ourselves will later go beyond zero.’ In Malévitch. Actes du Colloque International tenu au Centre Pompidou, L’Âge d’Homme, Lausanne, 1979, p. 181. This review project was not carried through, even if all the materials were in place by 1916 for a collection titled Supremus, publication of which was prevented by the revolutionary events of 1917. See the history and reconstitution of this volume in Aleksandra Shatskikh, Kazimir Malevich i obshchestvo Supremus [Kazimir Malevich and the Supremus Society], Tri kvadrata, Moscow, 2009, and English shortcut variant : Black Square, Yale University Press, New Haven and London, 2012. 8 ‘It is hard to fit contemporaneity into a triangle, for today its life is quadrangular’ (note from the 1920s). 9 Das grundliegende suprematistische Element. Das Kvadrat (1927, Kunstmuseum Basel), in: Kasimir Malewitsch, Die Welt als Ungegenständlichkeit (ed. Britta Tanja Dümpelmann), Hatje Cantz, Ostfildern/Basel Kunstmuseum, 2014, p. 107. Aboveall, Malevich affirms quadrangularity as such, contrasting it with triangularity which, over the centuries, had always represented the divine. Manifestly, the problem for Suprematism was not one of geometry (as was sometimes the case with proto-Cubist Cézannism), but of the pictorial as such and, for Suprematism, the pictorial meant a coloured plane, absolute planarity. The dimen- sion of this planarity was the fifth dimension, or economy. The ‘black square’ is present in 1913 in the costumes and sets that Malevich designed for Matyushin’s opera Victory over the Sun (with a prologue by Khlebnikov and libretto by Kruchonykh), and most obviously in the costume of the Gravedigger, whose body consists of a black square (the form is repeated like an armband on the character’s two arms). Moreover, Victory over the Sun conceptually manifests what would be the position of black in Malevich’s colour system. In the libretto the light of the sun is seen as lighting up the ghosts of the real. This accounts for one of the meanings of Black Square: it is the dark side of the world that has swallowed up in the shadows of Nothingness the false light given by the sun. True light is therefore not the light of the sun but the light that emanates from the depths of the objectless. If, formally, the Black Square attacked ‘the founding principle of painting,’ by limiting itself to the ‘ultimate components that designate spatialisation,’13 then conceptually it revealed a new, non-naturalist face, making the pictorial its place of realisation. 10 Kazimir Malevich, On New Systems in Art, Vitebsk, 1919. Translated from French in Écrits, op. cit., p. 245. 11 Kazimir Malevich, The Suprematist Mirror, Petrograd, 1923. In Crone, op. cit., p. 197. 12 Letter from K. Malevich to Pawel Ettinger dated 3 April 1920 (in Polish), Malevich o sebe [Malevich by Himself] (I. Vakar, T. Mikhiyenko], Moscow: RA, 2004, vol. I, p. 125. 13 Dora Vallier, ‘Malévitch et le modèle linguistique en peinture,’ Critique, May 1975.
aesthetic debates about colour in Russia. For Malevich, colour was an energy that wells up from the material. As he wrote in 1920: ‘The main thing in Suprematism are its two foundations, the energies of black and white. Black and white that serve to cast light on the form of the action; all I saw was the purely utilitarian need of economic reduction. That is why everything coloured is eliminated.’14 If Malevich rejected retinal painting, he did not do so in the same way as his contemporary, Duchamp, who sought to replace painting with productions arising from a conceptual type of decision-making. As a Russo-Ukrainian, Malevich was an heir of icon painting. ‘The square is a living, royal infant15 full of life. It is the first step of pure creation in art.’16 Having bestowed iconic status on the easel painting, he presents it as ‘manifestation, energy, light with a spiritual essence.’17 The whole of Malevich’s colourist poetics is elaborated out of sensation: ‘one should rather speak of the correspondence of colour to sensation than its correspondence to form.’18 The black of the square, the circle and the cross can thus be interpreted as the unassailable shadows of apophatic mysticism. The second basic element of Suprematism is the Black Circle, obtained by rotating the square. 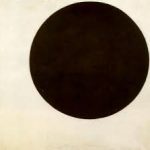 Curiously, enough, the first Black Circle, made in 1915, does not appear in the famous photograph of the ‘Suprematism of Painting’ section at the ‘0.10’ exhibition, nor is it mentioned by name in the catalogue. Nor does it appear in any of the photographs of exhibitions put on during Malevich’s lifetime.19 According to the drawing Malevich made for his Bauhaus book in 1927, this was the ‘second ele- ment of Suprematism,’ ‘a basic element of 1913 Suprematism.’20 The Black Circle evokes the metaphor/metonym of the eclipse of the sun explored in the alogical works of 1914, before the creation of the Square-Circle-Cross trinity.21 In all the drawings showing this form, the Black Circle is seen in a state of levitation; it has just crossed the white space of the canvas and is heading into the infinite beyond. It can be said that the Black Circle is the starting point for all the complex polychrome Suprematist works, in which the geometrised forms are seen in a state of suspension on the white canvas, at once static and dynamic. The painter places them at a phase of their movement that is between their arrival and the moment where the traversal will begin. This decentred position appears in the 1918 White Square (MoMA), which, one could say, is the emblem of the ‘White on White’ series. 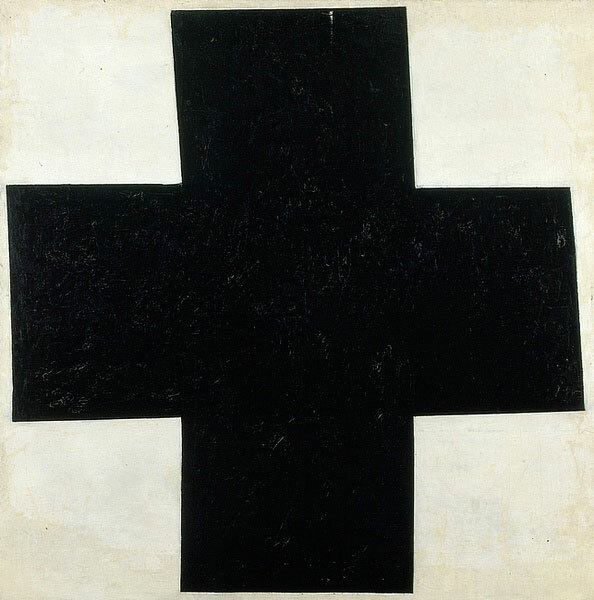 Where the Black Square and Black Cross occupy a central position on the canvas, the Black Circle, by its ascending movement, announces the same movement in the White Square. According to Malevich’s caption for a drawing from 1927, the Black Cross is ‘the third basic Suprematist element.’22 It is also the second Suprematist form to be derived from the Square, after the Black Circle. It featured in the foundational exhibition ‘0.10’. From a formal viewpoint, the Black Cross is constructed around the intersection at the centre of two rectangularly extended planes. As with the Black Square we will note that once again here the geometry is not exact. There is a slight curve to the axes that injects dynamism into the stability of this cruciform architecture on the white space of the canvas. Like the Square and the Circle, the Cross shows a tensional equilibrium between static and dynamic. Nothing seems to be moving and, at the same time, everything is ready to launch out or collapse. This recalls Zeno of Elea’s assertion that the flying arrow is motionless. 14 Kazimir Malevich, Suprematism 34 Drawings, Vitebsk, 1920, trans- lated from Écrits, op. cit., p. 251. 15 Note that the Russian word used here for ‘child’ is mladiénets, which is a literary word, used in particular with reference to icons of the Christ Child. 16 Kazimir Malevich, From Cubism and Futurism to Suprematism: The New Realism in Painting, quoted in John Golding, Visions of the Modern, University of California Press, 1995, p. 177. 17 Cf. Père Paul Florensky, L’Iconostase , in: La Perspective inversée suivi de l’Iconostase (trans. and annotations: Françoise Lhoest], L’Âge d’Homme, Lausanne, 1992, p. 14. Nikolai Tarabukin notes that in the masterpieces of the School of Novgorod (14th-15th century) colour is ‘saturated, extraordinarily saturated and energetic.’ N. Tarabukin, Filosofiya ikony [Philosophy of the Icon] , Moscow, 1999, p. 129. 18 Kazimir Malévitch, Essai pour déterminer l’interdépendance de la couleur et de la forme en peinture [Kharkiv, 1930], in Écrits, op.cit., p. 575 Translation in Gilles Néret, Malevich, Taschen, 2003, p. 51. 19 The Black Circle was first shown publicly as the illustration for the short treatise From Cubism and Futurism to Suprematism: The New Realism in Painting, reproduced back to front. It entered the collection of Matyushin, and was later acquired by Nikolaï Khardzhiev, from whom it passed, via the Gmurzynska gallery, into another private collection. 20 In Die gegenstandslose Welt (Munich, 1927) the drawing, now held at the Kunstmuseum in Basel, is reproduced, reversed from left to right, on p. 68. See the only original in: Kasimir Malewitsch, Die Welt als Ungegenständlichkeit, op. cit., p. 108. 21 The words ‘partial eclipse’ are painted on the two canvases An Englishman in Moscow (Stedelijk Museum, Amsterdam) and Composition with Mona Lisa (Russian Museum, Saint Petersburg). 22 Kasimir Malewitsch, Die Welt als Ungegenständlichkeit, op. cit., p. 109. 23 Facsimile in Andréi Nakov, Malewicz le peintre absolu, Paris: Thalia, Paris, 2006, v. 2, p. 213. 24 § 34. Translation by Joseph P. Smith, Paulist Press, 1978. The three fundamental Suprematist forms were presented by the painter himself in two different ways. The Black Square, Black Circle and Black Cross were first placed side by side in that order in a little book lithographed at Vitebsk in 1920, Suprematism, 34 Drawings. They reappeared in 1926 as part of the magnificent created by the painter for the State Institute for Artistic Culture (GINKhUK) in Leningrad. The three canvases framed a big ‘Suprematism in Architecture’ drawing representing a planit, that is, a futuristic house in the cosmos, and titled ‘The Pilot’s Planit.’25 The drawing was placed on a sloping plane, receding towards the top, as if moving upwards in interplanetary space – the plan- ets on this occasion being the Black Square at lower left, the Black Circle in the top middle and the Black Cross at bottom right. The order of procession here was different from the one Malevich had proposed in 1923-24 for the hanging of his three paintings in Venice. The Black Cross emerges from an extension of the square along the horizontal and vertical axes, forming a perpendicular crossing, and its rotation then engenders the Black Circle.26 The Black Circle then becomes the culmination of the movement of the Universe, of ‘cosmic thought’, of the suns, of the starry sky, of comets and all the ‘objects’ that ‘cast out on the infinite path of the objectless.’27 This aspect is very clearly shown in a relief made by Malevich with the Unovis collective in Vitebsk in 1921.28 showing the curve of the Universe surrounding a black circle, shadows of Nothing, of the objectless, of non-being, over which hover arkhitektons, while small Suprematist planits are scattered in the white space. 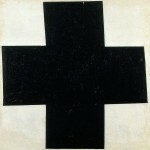 This universe of Malevichian ‘geometrical imaginaries’ is in turn framed by four black forms that can be read, clockwise, as a black triangle, which for Suprematists is the woodcutter’s wedge, a salient corner indicating the way towards the black square, a black cross and, finally, a black circle. The Black Square, Black Circle, and Black Cross are both iconoclastic and the foundations of a new iconicity: the world of objects is denied as illusory and phantasmal, but the black and white are absorption and diffusion of light, and this light/colour is now the place where the ‘world without object or eternal rest’ is manifested. 25 See the reproduction of the installation in In Malevich’s Circle: Confederates Students Followers in Russian 1920s – 1950s (ed. Yevghénia Pétrova), Palace Editions, Saint Petersburg: 2000, p. 111. The original drawing used to enlarge the installation at the GHINGKhUK is at the Stedelijk Museum in Amsterdam, cf. Troels Andersen, op. cit., p. 105, No. 87. 26 On the transformation of the basic forms of planar Suprematism (Square, Cross, Circle) at the Venice exhibition of 1924, see Patrick Vérité, ‘Sur la mise en place du système architectural de Malevič,’ Revue des Études Slaves, Paris, LXXII/1-2, 2000, p. 191-212. 27 Kazimir Malevich, God Is Not Overthrown, 1922. See Écrits, op. cit., §§ 9, 12, 13, p. 315, 318-320. 28 Unovis Collective, Suprematist Relief, 1921, Kröller-Müller Museum, Otterlo, reproduced in: Leah Dickerman, Inventing Abstraction 1910-1925. How A Radical Idea Changed Modern Art, Thames and Hudson, New York, The Museum of Modern Art, 2012, p. 269. 29 For a summary of the questions raised by Malevich’s antedating of his post-Suprematist works, see Frédéric Valabrègue, Kazimir Sévérinovitch Malévitch, Images en Manœuvres, Marseille, 1994, p. 234 ff. In the case of canvases that, like Complex Presentiment, are totally new creations, with no precedents, his camouflage is poignant testimony to the increasingly coercive policies pur- sued by Soviet power against intellectuals and artists, but also against the people, and in particular the peasantry, on the pre- text of ‘dekulakization,’ that is, the struggle against the wealthier, land-owning peasantry. As of 1928, the Terror spread throughout the entire Soviet Union, and especially Malevich’s homeland of Ukraine, where the Famine–Genocide (Holodomor) took millions of lives in 1932–33. 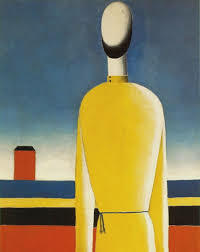 Malevich did not stop painting. He offered new developments, reaffirming the essence of Suprematism in ‘the deployment of colour and its weakening through the dependency of dynamic tensions.’30 He tried desperately to find work in a research laboratory but was systematically denied any kind of activity by the Stalinist authorities. This tragic dereliction of man ‘cast into the world’ is manifest in this absolute masterpiece that is Complex Presentiment. It introduces Malevich’s motif of the windowless red house. This is the prison in which man in totalitarian society is now confined. Malevich once said that he did not do faces because he could not see the man of the future, or rather, because man’s future was an unfathomable enigma. In these faceless faces, Malevich is conveying the sensation of emptiness. There is something lunar in this tilted oval underscored by the crescent shape of the beard. References to Christ are strongly present, often camouflaged, in many of the post-Suprematist paintings.31 Starting in the watershed year of 1930, the world of the peasantry becomes Malevich’s main subject. The hieratism of icon painting is expressed in the actions and poses, which have a typically Orthodox sacral character. In Complex Presentiment the character is a peasant, not as a representative of a given sociological segment of society, but as a paradigm of man before eternity. The blouse, typical of the peasant world in Russia, is not a precise model (the artist was photographed wearing one in Kursk in around 1906). His hands hang down by his sides, a posture that was de rigueur in Orthodox services. This pose can be found in many other masterpieces from 1930-33. 30 Letter from Malevich to L. M. Antokolski, 15 June 1931. 31 Cf. Valentine Marcadé, ‘Le thème paysan dans l’œuvre de Kazimir Sévérinovitch’, Malévitch. Cahier 1, L’Âge d’homme, Lausanne, 1983, p. 7-16. 32 Cf. in French, Dmytro Gorbatchov, L’Art en Ukraine, Musée des Augustins, Toulouse, 1993, pp. 24-25. 33 On light in icons, cf. Egon Sendler, The Icon: Image of the Invisible. Elements of Theology, Aesthetics and Technique, Oakwood Publications, 1999.